DIAMOND LACE 9 inch Red Bowl. 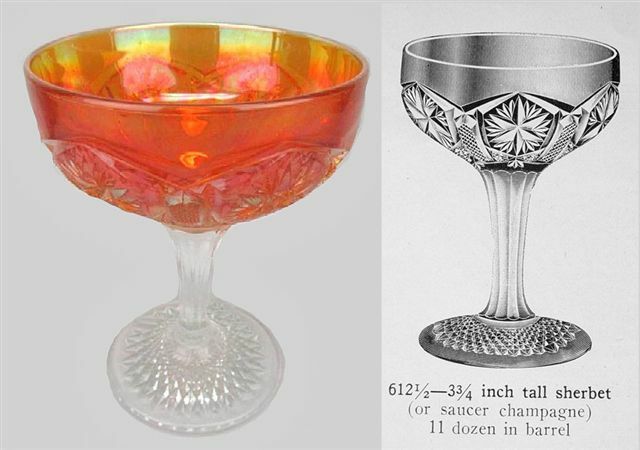 DIAMOND LACE 9” bowl: This red example poses the question: When and Who produced it? 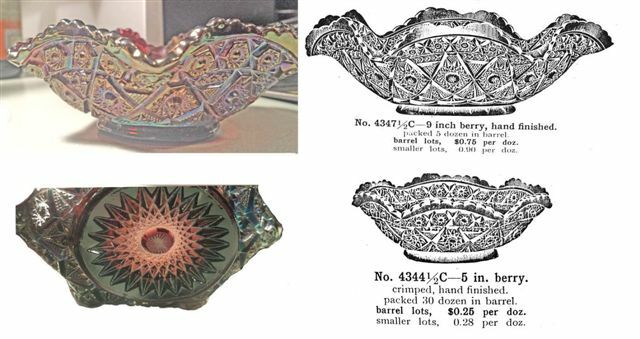 When Carl Burns published his 1996 Imperial Book, only marigold and purple are listed as colors within the 8” and 9” berry bowl set. Red and green are listed colors in the 7”- 8” rosebowl, reproduced in the 1960s and early ‘70s; said to be clearly identified with the IG trademark. 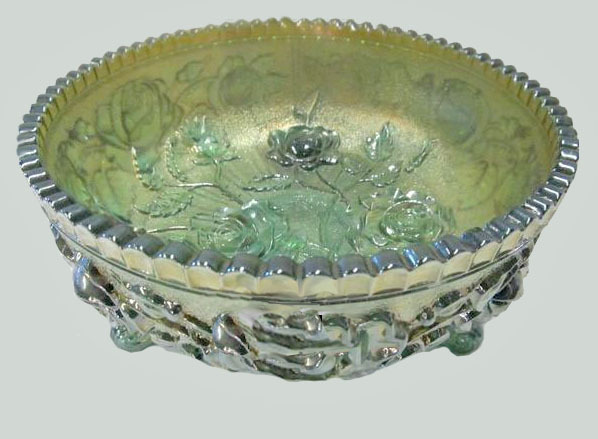 FROSTED BLOCK rosebowl: Interesting what people will pay for a made-over-bowl which was not included in a factory shipment of product. 474 - Imperial Factory Catalog #104A. 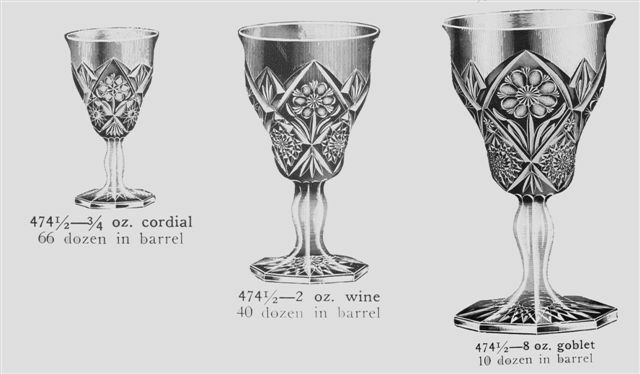 474 Goblet, Wine and Cordial which is 3 in. high. 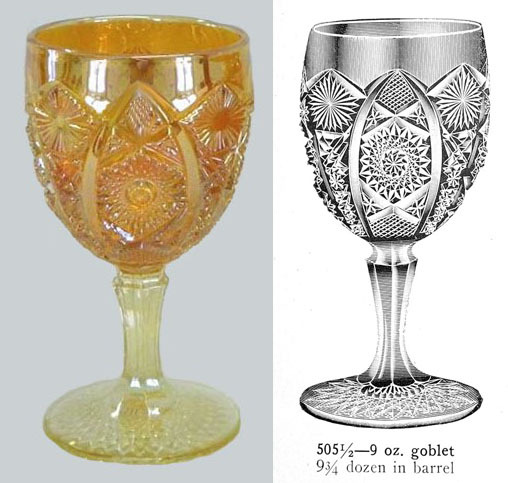 FOUR SEVENTY FOUR goblets: The scarce water goblet is found in marigold, purple and helios. 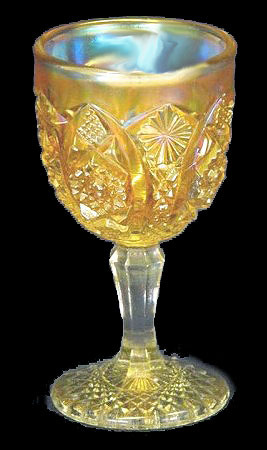 The rare wine glass is known in marigold. 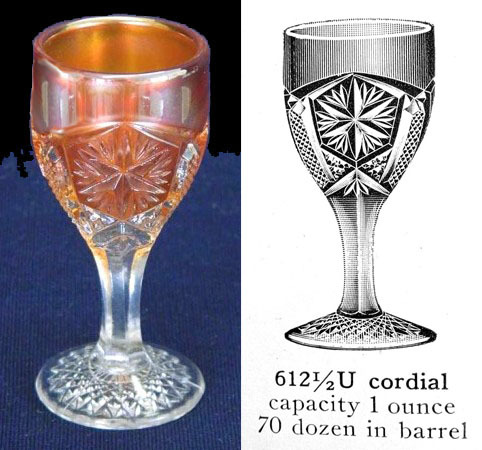 The one-ounce cordial is extremely rare, known in marigold and purple. 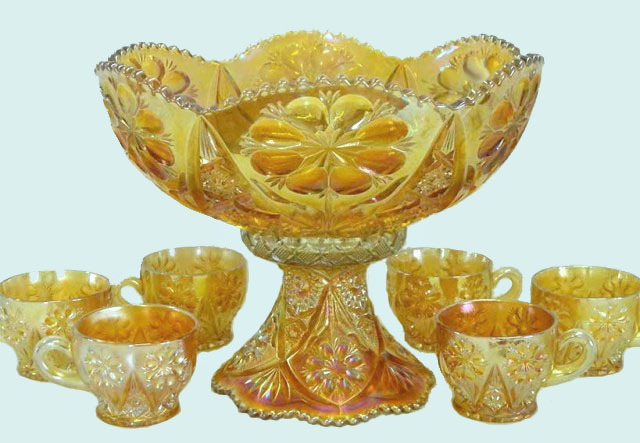 FOUR SEVENTY FOUR punch set: This punch bowl/base are available in marigold, helios, purple, emerald, aqua (with olive base only) Marigold is quite available. The treasured purple examples are quite rare. The emerald sets are treasured. Aqua is also quite rare. OCTAGON Cordial - 3.5 in. hiigh. 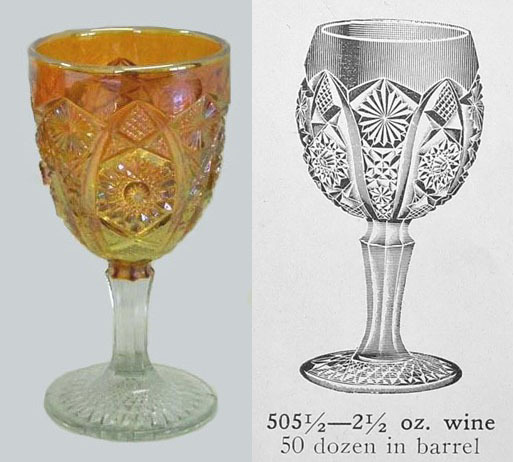 OCTAGON water, wine & cordial: The water goblet is found in marigold, amber, and light blue with marigold overlay. The stemmed wine: marigold, purple, helios, clambroth, aqua, and white. The one ounce cordial is known in marigold and aqua. This cordial is quite rare in marigold, with only one example confirmed in aqua. PANSY 9 inch Bowl in Purple. 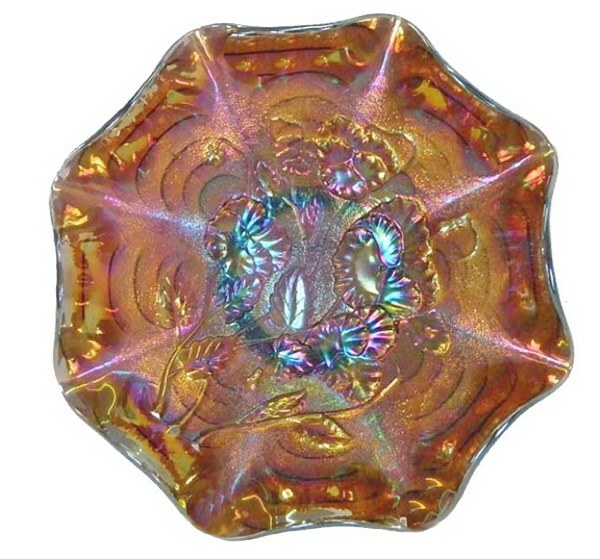 PANSY Bowl: The 8” -9” ruffled bowls are found in marigold, purple, helios, lavender, smoke, amber and aqua. There is a low ruffled 9 ½” bowl as well. It is found in marigold, purple, helios, smoke, lavender and amber. Some collectors consider these to be “plates”. In the true sense of the word plate: “if you can’t scoot your food off the edge, it cannot be considered ‘a plate’. LUSTRE ROSE Fernery in Helios Green - 8.5 inches. 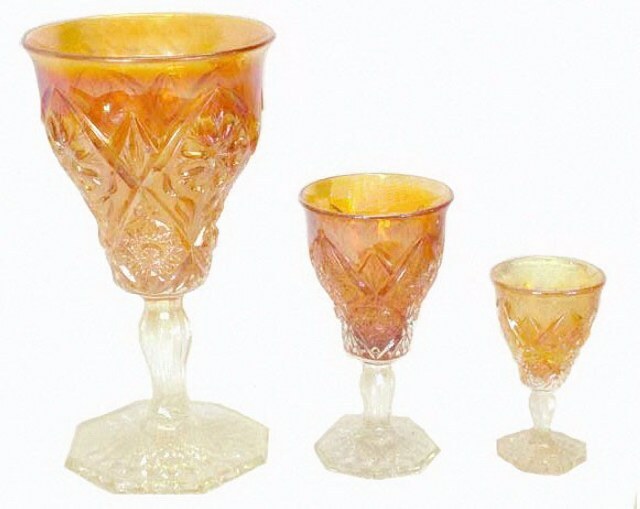 LUSTRE ROSE fernery: This is one of the most extensively produced designs by Imperial. At least 18 shapes in a wide array of colors exist. These footed ferneries are found in numerous colors. Along with marigold, even purple and helios examples are not too difficult to locate. The blue examples do not require too much effort to locate! The more rare examples are known to exist in amber, aqua, teal, clambroth, olive, smoke, amberina and a lovely frosty white!. These are all rare, with amber and clambroth requiring the least effort to locate. A couple of examples are known in a deep red color and a brilliant yellow/vaseline tint. STAR & FILE cordial and champagne: This is another plentiful pattern from Imperial. 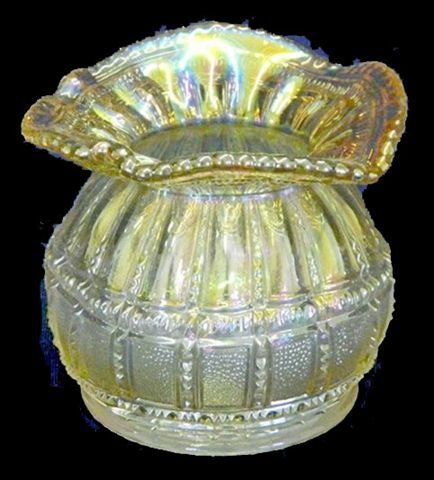 One of their best sellers, this pattern remained in wholesale catalogs as late as 1929. However, both the cordial and champagne are extremely rare. Marigold was the prevailing color among all shapes within the pattern. The cordial holds only one ounce! or the pitcher shattered at the fountain, or the wheel broken at the well. Then the dust will return to the earth as it was, and the spirit will return to God who gave it. yes, he pondered and sought out and set in order many proverbs. The Preacher sought to find acceptable words; and what was written was upright—words of truth. The words of the wise are like goads, and the words of scholars are like well-driven nails, given by one Shepherd. And further, my son, be admonished by these. Of making many books there is no end, and much study is wearisome to the flesh. Let us hear the conclusion of the whole matter: Fear God and keep His commandments, for this is man’s all. For God will bring every work into judgment, including every secret thing, whether good or evil.